Summer has arrived in Texas, and thankfully the end of academic year craziness is slowing. That means time to brew! The saison I brewed in April finished fermenting and is stored somewhere special. To give a hint: don’t expect tasting notes anytime soon, perhaps next year, although do expect a blog post very soon on its whereabouts. Sensibly, I saved the saison yeast cake, which means I’ll be brewing tonight! Look for brewing updates @apthomebrewer on my twitter feed. I like session-able hoppy beers during the 90+F Texas weather, so I’m brewing up a hoppy saison, ~5% ABV, 30 IBU, with loads of Saaz late and dry hops. Look for a hoppy saison post soon! In other happenings, on Saturday, I attended the May monthly meeting of my homebrew club, Austin Zealots. 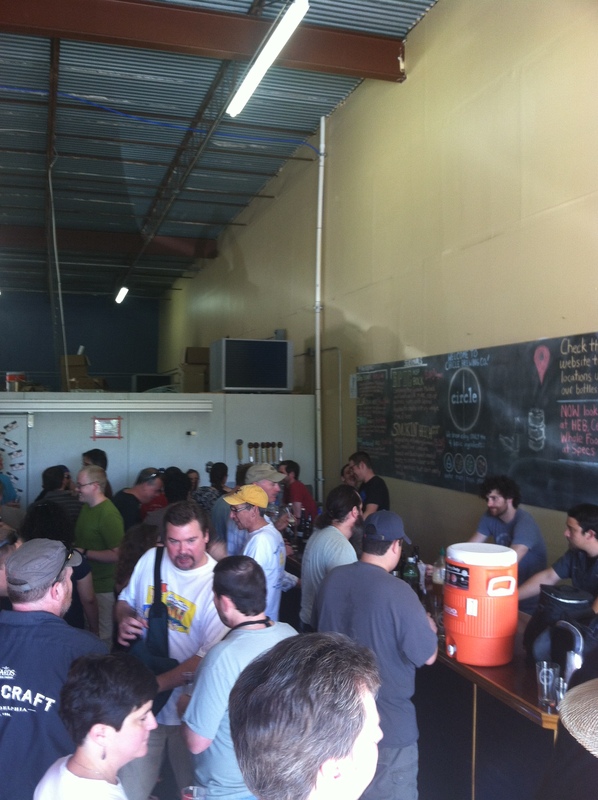 It was held at Circle Brewing Co. in Austin, TX, about 15 minutes Northwest of downtown Austin. The monthly style was bocks and smoky styles, but as standard tradition, no one ever follows the meeting style schedule, so I got to try just about everything. Indeed, I sampled many tasty beers, including a few perfect German pilsners, some great APAs and saisons, and a delicious coconut porter that tasted like an Almond Joy! Also, I received some good feedback and a few rave reviews on my Falconer’s Flight APA and Passion Fruit Wheat. Look for tasting notes on my single hop APA soon! That’s all from me now, time to get brewing! How was your week of homebrewing, and do you go to homebrew club meetings? If so, leave your thoughts in the comment section below. Cheers, and happy brewing!